We feel pretty lucky to live only about three hours from one of our favorite places, and therefore strive to get to Austin as often as possible. This time we hit the jackpot when Steve was called upon to do a few hours of work down Austin way right about the time Labor Day rolled around. Since the gas and partial hotel stay was covered, we took advantage and booked a three-night stay. During those four days, a very small portion of which actually had anything to do with ‘work,’ we challenged ourselves to get out of our Austin-rut (south Congress, yawn yawn) and see some new stuff. One thing that I had really been wanting to visit was the East Austin Succuents/ Tillery Gardens store. Turned out it was only about 8 minutes from our hotel. We tried to arrive early enough that the temps (which quickly rose to over 100 every single day) weren’t *too* much of a problem. Here we are wandering the awesome acreage, doing alot of chin rubbing and head scratching over all the funky/freaky native plant goodness! Having devoured the last six month’s postings by Austinite (and award winning!) 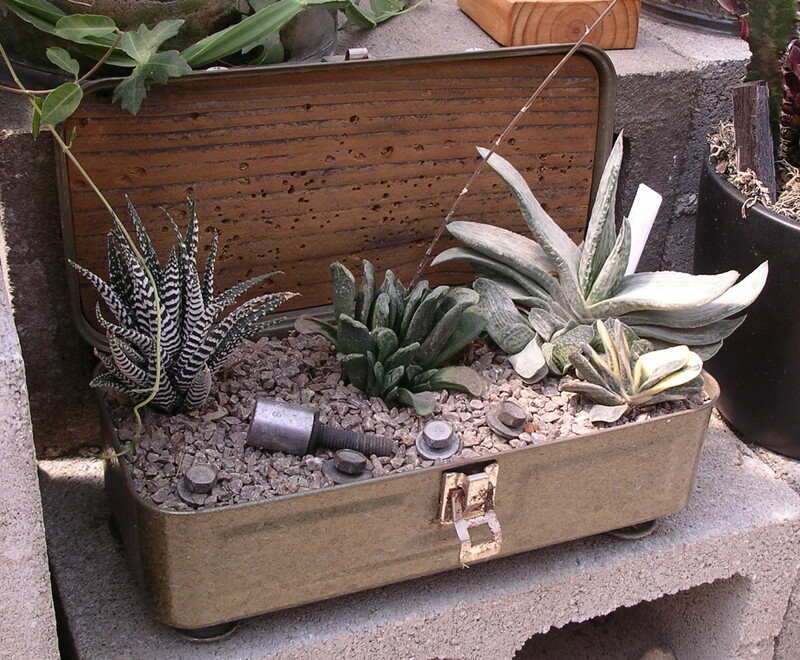 blogger Pam Penick’s wonderful “Diggin”, as well as the advice of others who’d been there, I was super stoked to check out this wonderland of plants. 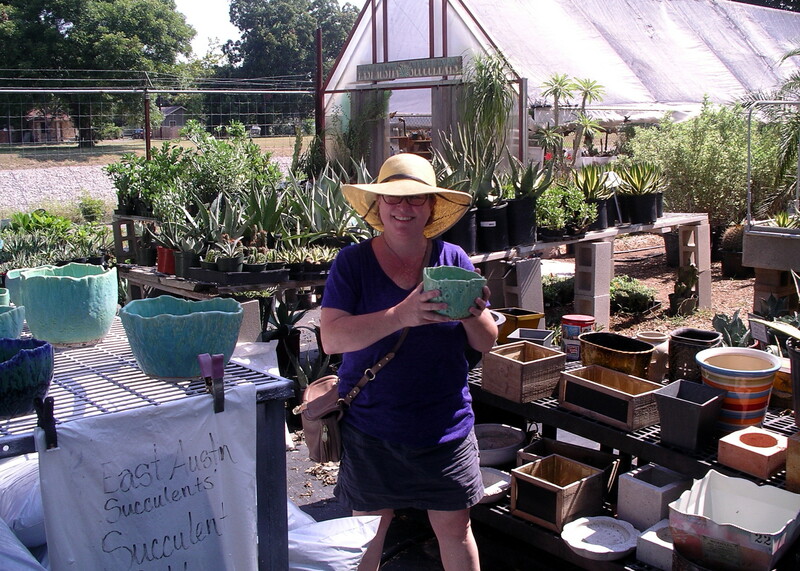 Not only did they have the *garden variety* (groan) succulents I’ve been buying for years,but also a number of unusual and new-to-me species of succulents, PLUS a load of native Texas shrubs, trees, and my favorite… awesmome handcrafted pottery! (okay, this was more than a mere journey to see neat plants. I really wanted to check out what other hypertufa artists were up to!) My images didn’t do these pots justice at all. I picked up a few tons (well, pounds) of glass shard rocks in beautiful blues and greens for a future display on the front-garden pond, and a goodly number of small funky succulents. But my most amazing discovery was a potter whose work I will devote an entire blog entry to. We were lucky enough to meet him in person at the succulent show that was going on that same weekend right across town at the Zilker Park Botanical Gardens! How lucky could we be!? Here’s me holding one of his pieces on display at East Austin/Tillery Gardens. So glad I held out and waited till we were in the presence of the Man himself. Not only did he offer up a ton of great pots with the most intense glazes, but many of them were potted up with incredible succulents and cactuses. We displayed a good deal of self control in acquiring only three. But we’ll be back.